Discount available! 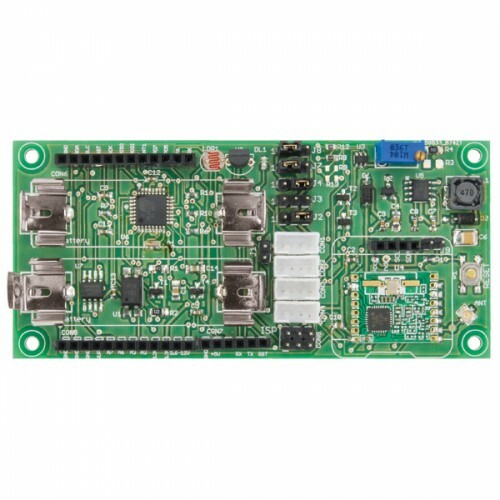 Recommend ANTENNINO - Arduino-RF multifunction board to your friends and get your Discount. Antennino (the name Antennino is the combination of Antenna and Arduino) is a low-cost and low-power board based on the Atmel chip, then 100% compatible with the traditional Arduino IDE. The board integrates sensors and bus communication to get external information, as well as a wireless link to communicate with the outside. Depending on how it is equipped, it can work both from a remote module and from an information collector (gateway). The heart of Antennino is an ATmega328P microcontroller (the P indicates that it is a chip that adopts the PicoPower technology, essential for the energy management desired in the project). 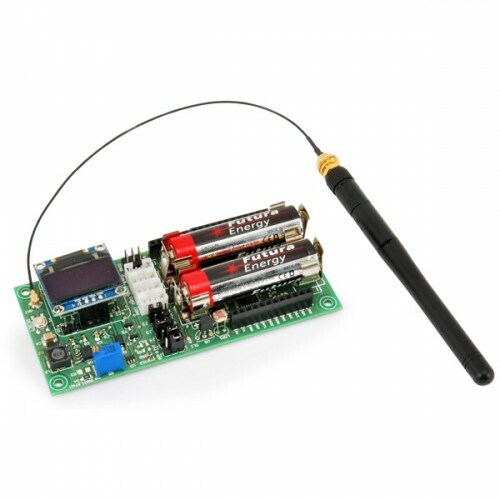 Communication with the outside world takes place via a transceiver module RFM69 (www.hoperf.com) transceiver that operates in the 433 MHz frequency band and supports AES encryption at the hardware level. On board the Antennino a Flash memory (AT25F512B - 512 Kbit) has been prepared that can be used to store data related to the reading of the sensors (Data Logger) or to implement the Wireless programming (OTA) of the antennino module, a sensor temperature (DS18B20) and a photoresistor. To make easy the use of additional external sensors, there are four Grove connectors: one for the RS232, one for the I²C-Bus, one for generic I / Os and one for analog input. Furthermore, Antennino is designed to host a small OLED display (sold separately - see related products), used if it operates in gateway mode. Antennino has the same processor of Arduino Uno and therefore in practice could be used as a substitute for it, but given the wireless vocation of our module, the main use is to realize remote sensors or actuators that can exchange information with a gateway. We could produce temperature sensors, brightness sensors, alarm sensors for doors and windows, vibration sensors, remote actuators to control a device, etc. This is remote-module operation. 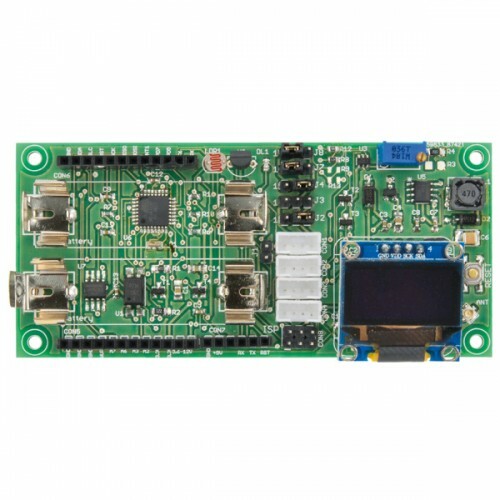 The gateway can be an Antennino module (in gateway mode), or, since usually the gateway is not powered by batteries, it could be an Orduino One equipped with an RFM69 module, or a Raspberry Pi, always accompanied by an RFM69 module. The solution with Raspberry Pi is the one that is most suitable, because it allows you to create a manageable system with a very attractive Web interface, with security requirements (https) and use a database to store or post the received data. 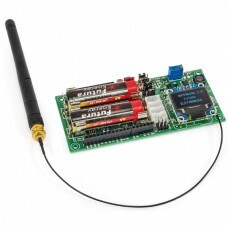 • directly feed Antennino with a voltage of 3.3V, bypassing all the regulators present on board the board. In the latter event, remember not to exceed the voltage of 3.3V, otherwise you will damage the microcontroller and the various chips connected to it. N.B. 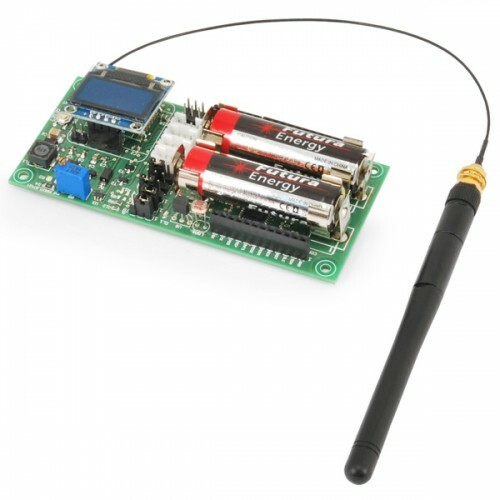 the 433 MHz antenna with SMA connection, the SMA-UFL adapter, the OLED display and the batteries are not included, see related products. Normally, when a microcontroller of the PicoPower type is used, the management of the low consumption mode of the same occurs through specific libraries to be included in the firmware. There are different levels of depth in the low power mode and in the deeper one the chip is like hibernate and you can only wake it up by using an external hardware interrupt. But clearly if we wanted to make our remote sensor send us periodic reports, this solution would not be viable. A slightly less profound mode is, in fact, the one that is used when it is necessary that the microcontroller periodically awakens autonomously from the state of rest and performs some task, and then returns to "sleep". Normally the timer that awakens the microcontroller at regular intervals is implemented through a timer inside the microcontroller and therefore the same is not placed in a state of low consumption complete, but is left active what in jargon is indicated by the acronym WDT (Watch Dog Timer). Obviously the fact that there is a Timer and is active is discounted with a small but not negligible consumption of current that is of some μA. An alternative is adopted in Antennino, where we use an external interrupt handler to wake up the microcontroller. This concept will be extended by examining the circuit diagram of the circuit. Una peculiarità di Antennino è quella di poter sfruttare la potenzialità del chip TPL5110 (Texas Instruments) che in pratica è un timer digitale con un intervallo di intervento nel range 100 ms÷7.200 s (2 ore) che in modalità standby assorbe circa 35 nA (avete letto bene: solo 35 miliardesimi di ampere) e che permette di controllare la linea di alimentazione tramite un P-MOS escludendo tutto quello che ne è a valle. In questo caso, quindi, la strategia di riduzione di consumi è delegata completamente al chip TPL5110. Il chip presenta un piedino di ingresso (DONE) che può ricevere un feedback dal microcontrollore allo scopo di disattivare immediatamente l’alimentazione se le operazioni che dovevano essere elaborate sono giunte a termine. Inoltre è presente un ulteriore pin di ingresso (DELAY/M_DRV) che dà la possibilità di forzare anticipatamente il risveglio del TPL5110 prima della scadenza naturale del timing impostato; questo permette di recepire un interrupt da una fonte esterna, gestirne le richieste e poi inviare un comando DONE al TPL5110 e tornare immediatamente in modalità LowPower, disattivando tutto tranne il TPL5110. A peculiarity of Antennino is that of being able to exploit the potential of the TPL5110 chip (Texas Instruments) which in practice is a digital timer with an intervention interval in the range 100 ms ÷ 7,200 s (2 hours) that in standby mode absorbs about 35 nA ( you have read well: only 35 billionths of ampere) and that allows to control the power line through a P-MOS excluding all that is downstream. In this case, therefore, the consumption reduction strategy is completely delegated to the TPL5110 chip. The chip has an input pin (DONE) that can receive feedback from the microcontroller in order to immediately turn off the power supply if the operations that were to be processed are completed. In addition there is a further input pin (DELAY / M_DRV) which gives the possibility of forcing the awakening of the TPL5110 in advance before the natural expiry of the set timing; this allows an interrupt to be received from an external source, manage the requests and then send a DONE command to the TPL5110 and immediately return to LowPower mode, deactivating everything except the TPL5110. 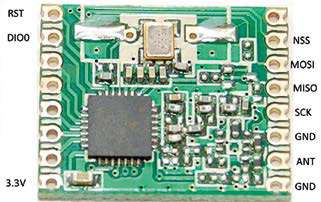 The wireless module used in Antennino, for free use to perform relatively short transmissions, works at a frequency of 433 MHz. For our application, it is OK, as a gateway and remote module will only communicate to exchange sensor status information. In the latest versions of the RFM69 transceiver libraries, the possibility of self-adjusting the transmission power level has been introduced through a feature called Automatic Transmission Control (ATC) that further reduces the consumption of the Antennino module during the transmission phase, automatically negotiating the minimum power required for data exchange. The SPI protocol is used (serial MISO, MOSI, SCK, RST) a Chip Select pin (NSS) and a pin (DIO0) of Interrupt notification to the microcontroller more naturally, the power supply and the pin for the antenna connection external. 433 MHz foldable antenna with SMA connector. Length (mm): about 107. ..